The AFB Platinum MERV 13 furnace / air filter is a best in class, hospital grade filter. 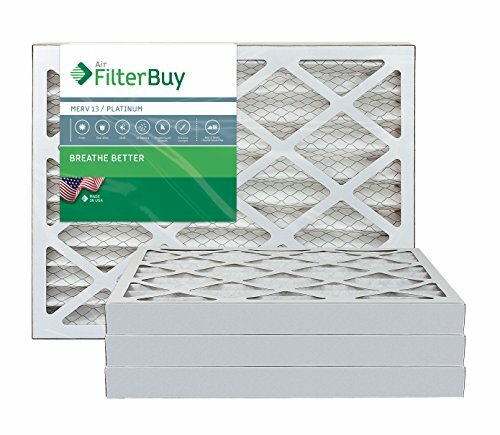 The Platinum filter by AirFilterBuy offers the best level of filtration possible while still allowing a traditional residential or business HVAC unit to function efficiently. The AFB Platinum filter removes very fine particles from the air in your home, as well as potential allergens like mold, pet dander, bacteriaóeven particles that carry viruses. We recommend the AFB Platinum filter for use by homes or offices occupied by people suffering from asthma or other respiratory illness. Whenever you are choosing an air filter, make sure that you compare the nominal and actual size of the furnace filter that you are replacing. In this case, both the ‘nominal’ size AND the exact size of the filter is 12.75x21x2. Generally, the nominal size is rounded and in bigger print while the actual size is in smaller print and in parenthesis to the side. The AFB Platinum MERV 13 filter is designed to last 3 months, or 3 times the average fiberglass filter. The filters ship directly from the manufacturer to your doorstep, allowing AFB the ability to offer a premium product at a reasonable price. Each quantity purchased is for a pack of 4 filters.